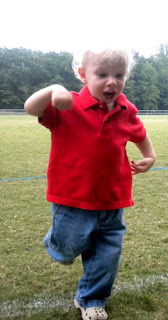 Krazy Krouse Kids: Future "Feetball" Star? This evening we went to cheer on the Theologs in IM football. Tucker had a great time throwing the "feetball." No kidding, that is exactly what he says. I am not sure he had ever played with a football before, but I have a feeling this will not be the last time he has a football in his hands. You can see the excitement on his face! He loved it!